He pumped his fists in the air to express his elation. Bangladesh found themselves in the rabbit role following their defeat in the inaugural Sylhet Test against Zimbabwe. On the morning of the first day’s play in Dhaka, they lost three early wickets to the fast bowlers and were staring down the barrel. However, Mushfiqur Rahim and Mominul Haque didn’t press the panic button and rather played in a matured way. The stand put on 266 for the third wicket and not only bailed the Tigers out of the precarious position but also put them in a commanding position on the close of play. After Tendai Chatara nipped out Mominul in the fag end of the day, Mushfiqur ensured that he remained not out on 111. He carried on in his own merry way in the second day’s morning score as well. He had Mahmudullah at the non-striker’s end. Following a partnership of 73 with Mushfiqur, Mahmudullah perished for 36 runs. However, the wicketkeeper-batsman raced to his second double century off 207 deliveries. His first 200 came against Sri Lanka in 2013 in Galle. He achieved the feat in the penultimate ball of the 154th over by part-timer Sikandar Raza. The 31-year-old pulled a short delivery from the tweaker down to square leg for a single to reach the milestone. Thereafter, he pumped his fists in the air and expressed his elation. He also became the first wicketkeeper to notch as many as two double-centuries. The seasoned campaigner ended his knock on 219 runs from 421 balls with the help of 18 boundaries and one six. To add to his delight, he also went to surpass Shakib Al Hasan as Bangladesh’s highest individual Test score of 217 against New Zealand in Wellington back in January 2017. Immediate after he surpassed the all-rounder, Mahmudullah decided to declare the innings with the score at 522/7 in 160 overs. In the meantime, Twitter hailed Mushfiqur for the superlative knock. Now @mushfiqur15 surpasses Shakib Al Hasan and becomes Bangladesh highest scorer in a Test innings. 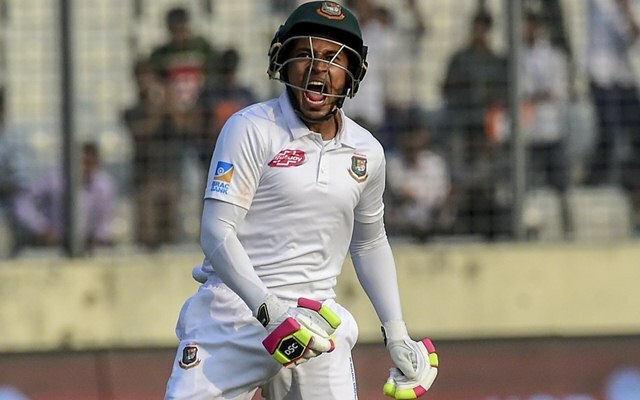 Mushfiqur Rahim brings up this year's first double-century in Tests. Also, becomes the first wicketkeeper to score two Test double-tons.